Géraldine Borio and Caroline Wüthrich have been living and working in Hong Kong since 2008 and 2010 respectively. With their architectural firm Parallel Lab they investigate various forms of occupancy of urban space in many different contexts around the world. Their socio-architectural research projects are meant to enhance the importance and chances of local bottom-up strategies. One of their recent projects is a study on micro-level urban life in Hong Kong, investigating the use of the narrow lanes running between the extremely densely built city’s high-rise buildings. These service lanes and passages offer space for a variety of small trades and businesses. Their semi-public space allows for different social interaction and informal encounters governed by other, equally informal, rules than the city as a whole. 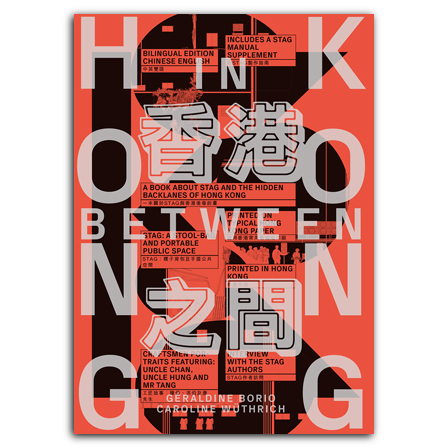 Hong Kong In-Between is a very attractive, nearly artistic presentation of Borio and Wüthrich’s findings. In black-and-white drawings, diagrams and plans, color and black-and-white photographs, and texts they show how people in Hong Kong occupy the city’s in-between-spaces. The book also documents the playful social interventions and experiments the two architects-researchers carried out within their project. , born 1981, is a founding partner with Parallel Lab in Hong Kong since 2010. She graduated in architecture from Ecole Polytéchnique Fédérale de Lausanne (EPFL) in 2007 and has been working with various firms in Beijing and Hong Kong 2008–10. She also teaches at the School of Design, Polytechnic University, Hong Kong. , born 1980, is a founding partner with Parallel Lab in Hong Kong. She graduated in architecture from Ecole Polytéchnique Fédérale de Lausanne (EPFL) in 2007 and has been working freelance and with an architectural firm in Geneva 2007–10. She also teaches at Chinese University of Hong Kong and Hong Kong University.